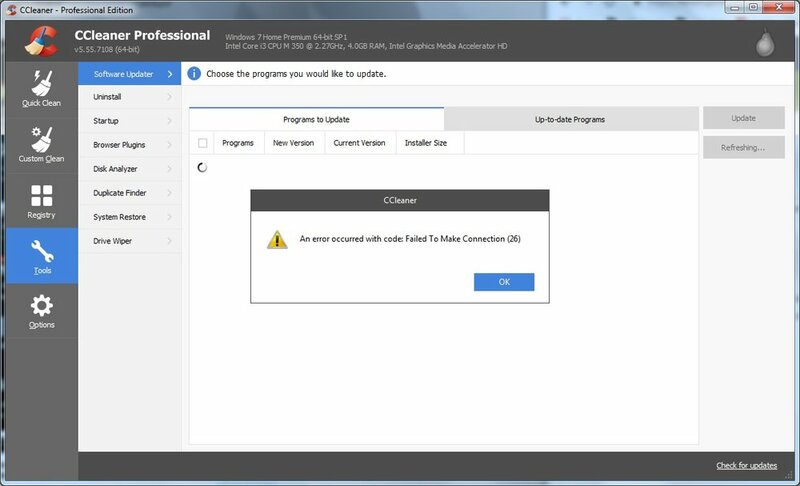 Installed v5.55.7108 (64-bit) today 3/12/19 and am getting "An error occurred with code: Failed To Make Connection (26)" when attempting to use the new Software Updater feature. I have the same problem when to trying to use the Software Updater feature. However, when I clicked the blue "Refresh" bar to the right I get a list of a few applications that are reported to need an update. Haven't tried updating yet. I may have looked over something important, but... at the homepage of Piriform it's stated that the new function was only for higher CCleaner versions, not for the "Free" one. And it's not listed in the overwiew list of function in the "Free" section. Really odd. Could it be that this new function was integrated into the free version by mistake? No mistake, they have done it deliberately - for advertising. If you try to use it in the Free version then you get a pop-up directing you to buy the pro version. Programmes that act like this are called 'crippleware', most people don't like crippleware or the software companies that resort to using it. EDIT - The Updater appears not to be working properly in the Pro version anyway, as evidenced by the above posts and other threads. I have the professional version. I allowed CCleaner to run through the firewall. That stopped the error as of last night. Now, the update applications option is gone from the menu. WTF? It looks like they have pulled the update feature because of all the errors and complaints. Add a feature that no one really wants, and that either doesn't work properly and/or annoys users with it's behaviour. Get a load of complaints. Remove (or change) the feature. They way they have done this one- removed the feature with no warning and without the users interaction or knowledge is concerning. If they change their own programme, without the users permission and without an update being needed, then what else are they changing in the background without telling you?